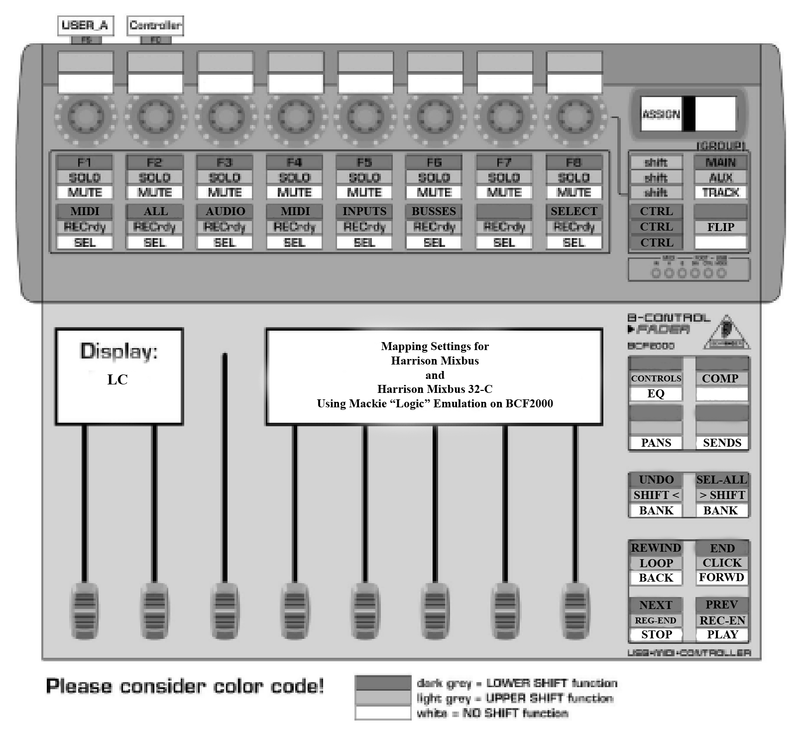 I’m working on this mapping chart for Mixbus and Mixbus 32-C (version 4) and the Behringer BCF2000 controller and could use some help with a few of the items. I’ve renamed a few of the names used in the manual, like changing “Cycle” to “Loop” for the button that turns a region into a loop and engages loop playback, and for “Enter” (now “Sel-All”) and “Replace” (now Reg-End, though I cannot find how to do the region beginning, as I cannot find the equivalent “Drop” button). Instead of “CH >>” and “CH < <” I have “Shift <” and “> Shift” for shifting the sliders; and “CR Up” and “CR Down” are now “Next” and “Prev”, since they cycle through the tracks. Five modes – Edit, Shift-Store, Store, Exit and Shift-Learn. Assigns Knobs to control PAN. Pressing knob enables/disables send to Master. Press knob to enable/disable associated send. Press “Flip” (Upper-left “Shift” with lower right “Option” key – or by image above, Shift-FLIP) to allow instead controlling the send levels with the sliders and the tracks’ volume with the knobs. Knob-1 — Not sure what it does! Knob-5 — Lights up blue dot at top of channel strip – no idea what it is for! PLAY does just that, and STOP stops. FORWRD shuttle-plays forward. Multiple taps speed up playback. Shift-PLAY enables all armed tracks for recording upon pressing PLAY. Shift-BACK turns on looping for a selected region. CTRL-BANK-Down is supposed to be “Undo” but I’ve not seen it work yet. CTRL plus the lower row of buttons takes you to different “Views” of the sliders. CTRL-Lower-Button-1 — MIDI Tracks: this shows only the MIDI (instrument) tracks on the surface. Audio tracks and buses will be skipped over, if you adjust the Channel or Bank buttons. CTRL-Lower-Button-2 — Global View (ALL): this resets the view to showing channels in sequential order, with the first available mixer channel on the far left of the surface. CTRL-Lower-Button-3 — AUDIO Tracks: this shows only the Audio tracks on the control surfaces. Midi tracks and buses will be skipped over, if you adjust the Channel or Bank buttons. CTRL-Lower-Button-4 — Audio Inst (MIDI): This operates the same as MIDI Tracks button. CTRL-Lower-Button-5 — INPUTS: This shows “buses” that were created with the New Track dialog. Buses are often used as live inputs to the mixer. MIDI tracks, audio tracks, and mixbuses will be skipped over, if you adjust the Channel or Bank buttons. CTRL-Lower-Button-6 — BUSSES: This shows the mix buses. CTRL-Lower-Button-7 — Outputs: Currently unimplemented; this will show the Click (metronome), Auditioner (solo bus), and Monitor buses in the future. CTRL-Lower-Button-8 — User (SELECT): This shows the first 8 channels that are “selected” in the mixer GUI. This allows you to select a discontiguous collection of channels, and control them side-by-side on the control surface. Need to find out what is the button for “Drop” for the region selection options to be useful. Please let me know of additions or corrections to this document and I will keep this first post updated.